Benzene is a sweet-smelling hydrocarbon present as a colorless liquid at room temperature. It is a highly-toxic chemical. Benzene Poisoning is the accidental or intentional intake of any product containing the compound. The exposure may be through inhalation, skin or eye contact, or following ingestion of the chemical. What are the Causes of Benzene Poisoning? What are the Signs and Symptoms of Benzene Poisoning? The signs and symptoms of Benzene Poisoning can vary from one individual to another. It may be mild in some and severe in others. Several systems of the body, such as the digestive system, respiratory system, vascular system, nervous system, skin and ENT may be affected. Regular exposure to benzene and its compounds in an industrial setting (for a prolonged period) can result in blood disorders including leukemia. How is First Aid administered for Benzene Poisoning? Who should administer First Aid for Benzene Poisoning? 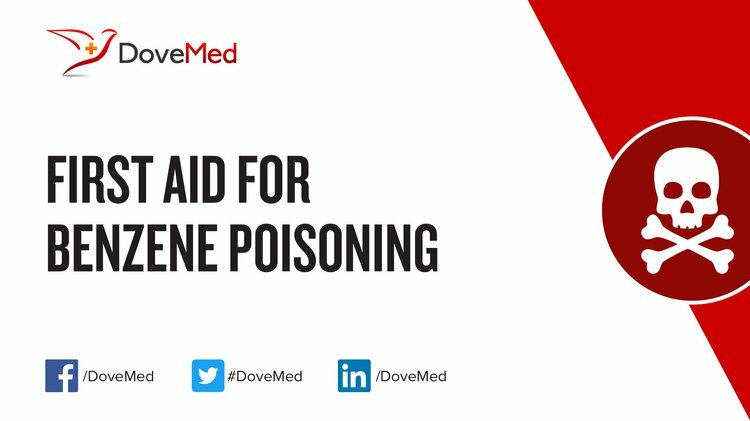 First aid for Benzene Poisoning is administered by healthcare professionals. What is the Prognosis of Benzene Poisoning? How can Benzene Poisoning be Prevented? Khalade, A., Jaakkola, M. S., Pukkala, E., & Jaakkola, J. J. (2010). Exposure to benzene at work and the risk of leukemia: a systematic review and meta-analysis. Environmental Health, 9(1), 31. Zhang, L., McHale, C. M., Rothman, N., Li, G., Ji, Z., Vermeulen, R., ... & North, M. (2010). Systems biology of human benzene exposure. Chemico-biological interactions, 184(1), 86-93. Llop, S., Ballester, F., Estarlich, M., Esplugues, A., Rebagliato, M., & Iñiguez, C. (2010). Preterm birth and exposure to air pollutants during pregnancy. Environmental research, 110(8), 778-785. Bayram, E., Linehan, J. C., Fulton, J. L., Roberts, J. A., Szymczak, N. K., Smurthwaite, T. D., ... & Finke, R. G. (2011). Is it homogeneous or heterogeneous catalysis derived from [RhCp* Cl2] 2? in operando XAFS, kinetic, and crucial kinetic poisoning evidence for subnanometer Rh4 cluster-based benzene hydrogenation catalysis. Journal of the American Chemical Society, 133(46), 18889-18902. Schnatter, A. R., Kerzic, P. J., Zhou, Y., Chen, M., Nicolich, M. J., Lavelle, K., ... & Irons, R. D. (2010). Peripheral blood effects in benzene-exposed workers. Chemico-biological interactions, 184(1), 174-181. Estarlich, M., Ballester, F., Aguilera, I., Fernández-Somoano, A., Lertxundi, A., Llop, S., ... & Iñiguez, C. (2011). Residential exposure to outdoor air pollution during pregnancy and anthropometric measures at birth in a multicenter cohort in Spain. Environmental health perspectives, 119(9), 1333. Adamkiewicz, G., Zota, A. R., Fabian, M. P., Chahine, T., Julien, R., Spengler, J. D., & Levy, J. I. (2011). Moving environmental justice indoors: understanding structural influences on residential exposure patterns in low-income communities. American journal of public health, 101(S1), S238-S245. Numbers, P. I. (2014). Product and company identification 1.